A couple Sundays ago we went out to Provo for the baby blessing of my sweet nephew Jax. He is the sweetest little guy ever, and I loved being there for his special day. 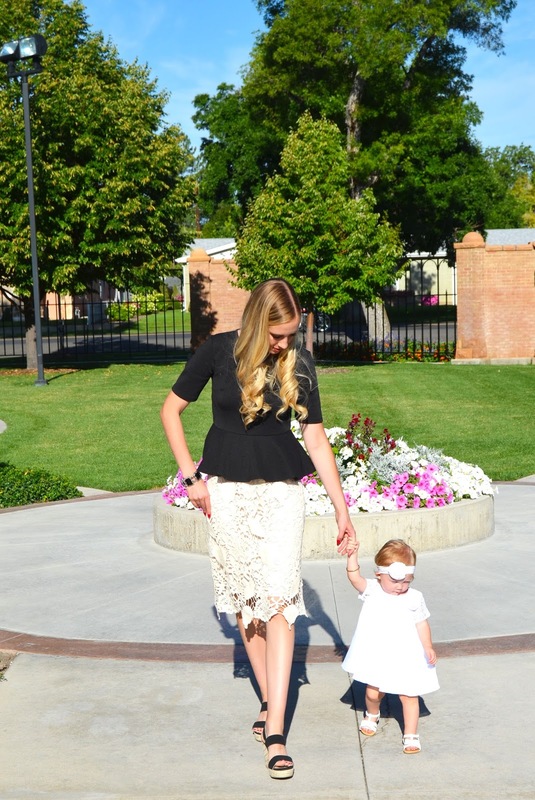 We stopped at the Vernal LDS Temple on the way out of town and walked on the grounds. I love all of the flowers and think that it is one of the most beautiful temples! I may be a little bit partial though because my dad does landscape it and I did get married here :) Rose was obsessed with the flowers, and loved smelling them! She also want to pull them all off though, so I had to reign her in a little bit. ;) My mom got Rosalie's cute dress on sale from The Children's Place, and it came with the cute little bow as well. I have been wearing this skirt quite a bit because I love it so much, and my shoes were on sale for $10 and come in a few different colors :) I hope you all have a wonderful Thursday! We are headed out to Chanse's graduation, and I'm so proud of him! Follow along on Instagram to see more pictures! Both of u look so adorable for the event! That is s super beautiful temple! 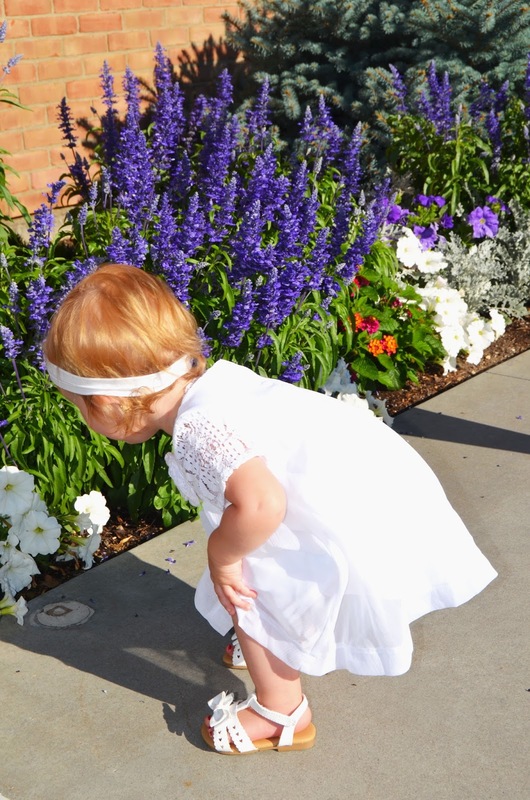 My grand daughter is doing the same thing which pulling off all my flowers. Lol! The smile on you face when you are looking at your daughter is so beautiful! Love it! I love your peplum top! It look so gorgeous with your crochet skirt. Your little baby is adorable, as always, too! I have one gorgeous sister & niece!! Love you both!! What an absolutely beautiful outfit, your crochet skirt is just stunning! love the outfit! the b+w is so classic! Beautiful photos and you girls are gorgeous, I really like that embroidered skirt, looks great with peplum top. Seriously love this skirt! I like how you paired with the white and black together. Thanks for linking up with us on Start The Week Stylish! You ladies look beautiful, I love the white and black contrast. I love how the two of you subtly match! 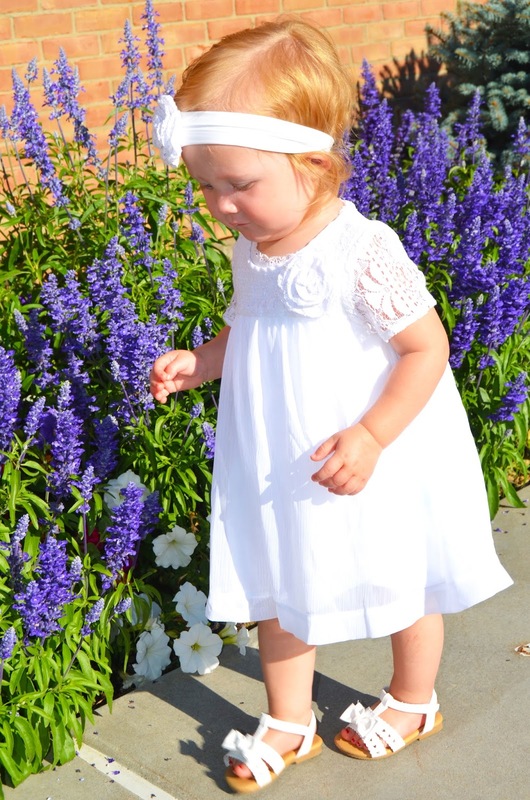 The lace detail on your daughter's dress compliments your skirt!